Being a Malt Whisky neophyte has been difficult for me. I have found a new love in my life and far too much information to digest in time to satisfy my urgent desire to dram with the best of them. Not long ago I really had no clue that whisk(e)y was anything other than Jack Daniel’s mixed with whatever made it tolerable. Friends had suggested I try some other American bourbons on the rocks only to find that the taste was equally unappealing to me. It was not until I was offered a version of the classic Rob Roy by my father one night that I discovered that whisky can be enjoyable. Having received the recipe from my father (1 part blended Scotch, 1/2 part sweet vermouth, 1 1/2 parts lemon-lime soda, Cherry) I set out to tend my home bar and enjoy one myself. Having found no Scotch in my cabinet, I made the same drink with the only whisky I had; Jack Daniel’s. The result was less than pleasant and almost cured me of my desire to re-create the concoction. To remedy the lack of proper stock in my cabinet, I set out to make a purchase of a bottle of Scotch. I discovered that I was entering a wing of the store I had not recognized before. The selection was overwhelming and I had no idea what to look for. I felt some internet research was in order. Upon using the search engines to seek some proper information on Scotch, I was hit with a plethora of sites wanting to sell me something liquid in a bottle. All I really wanted was a site dedicated to information so that I could learn what to look for in a bottle. I soon stumbled upon the Malt Madness website where I found precisely what I was looking for; The Beginner’s Guide to SMSW. Not only did I learn what to look for in a blend, but I found that I was intrigued by the Single Malt information I had been reading. I followed the advice and I set out to spend the appropriate amount of US dollars on a beginner’s collection of Malts. This is where I discovered my newest love. I have a voracious appetite and I desired more and more information. I began to converse with people who knew Malts (or so they thought). I even began to seek out new samples at restaurants and bars in my regular travels. Upon seeing a posting on the Malt Madness website for an Advanced Beginner’s guide forthcoming, I joined the mailing list and checked back regularly for updates on publication. This brought me to conversations with the Malt Master and when the concept of a Malt Minions Whisky School was developed, I jumped at the idea as this was just up my alley. I am a 37 year old attorney living in Orange County (the OC for all you TV watchers out there), California where the weather is rarely is harsh, the summer lasts for 9 months of the year and beauty dominates the landscape. I rarely get the opportunity to travel for business but recently I was asked to stand in for a client who was conducting some commercial transactions in Hong Kong. As I had never been to Asia and Hong Kong had never even made my list of places I would desire to visit, I thought the opportunity would allow for a new perspective on a locale that I would not otherwise experience. I must say, I was pleasantly surprised. 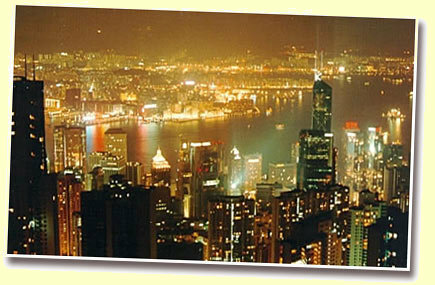 Hong Kong is a vibrant and bustling city of commerce. Having stayed in two hotels during my eight-day stay, both on the Hong Kong island, I found that a five mile stretch of road can produce profound differences even within the same general city. Being from Los Angeles, where the City is spread out over a vast geographical area, it is rare to experience such change within walking distance. The food in Hong Kong was absolutely marvelous and I am likely ruined on what we in America call Chinese food. Nothing I have ever eaten here can do justice to what the Chinese people eat every day. Being of Welsh descent and rather large by Chinese standards (6 foot, 240 pounds) I stood out everywhere I went. I am an adventurous eater and I sought eateries that had no western patrons and a line of Chinese guests. These are the places where you find the authentic food that best describes a people and their culture. The sea food was spectacular and the prices were unbelievably cheap by American standards. If ever you have the chance to be in Hong Kong, seek out the Spicy Crab or the baby conch in spicy sauce. The Rice Pots with your choice of meat was a new experience that I know will be difficult to repeat here in the states. The City is beautiful……. at night. During the day, the shiny new glass office buildings and hotels are marred by the black and dirty high-rise apartment buildings that fill in the gaps between the grandeur of the skyscraper corporate monuments to capitalism. The streets, while not specifically garbage filled, had a dirty, dingy feel to the entire region. Getting around is simple and also amazingly cheap. The tram, bus, and underground metro system were fantastic. Never did I feel out of reach to any part of the city. In Los Angeles, the transportation system consists of your own vehicle. Without it, your are alone and perhaps afraid. Not so in Hong Kong. My last evening in Hong Kong I sought the touristy experiences that most westerners partake in while visiting a foreign land. According to National Geographic Magazine, crossing Queen Victoria Harbor (the waterway that separates Hong Kong Island from Kowloon Peninsula [all still a part of Hong Kong City]) is one of the top 50 experiences that one should enjoy before he dies. I made a trip by metro to Kowloon Peninsula and walked the waterway for hours to take in the view. As the sun was setting, I arrived at the ferry terminal for a boat -ride across the harbor at night while the holiday lights adorned the sky-line across from me. Having seen the city brighten with beautiful lights and a panoramic view that only a ferry boat can provide, I completely understand why National Geographic made the recommendation. The experience was inspiring. From a different vantage point, the City can be viewed from above at “The Peak” at the top of the mountain directly behind and above the city on Hong Kong Island. I took the Peak Tram to the top of the mountain and found a lovely bar with a platform perched over the side of the cliff and an enormous glass wall where one could sit and view the beauty of Hong Kong at night while enjoying their favorite dram. Of course I had found what I had been looking for all week. Hong Kong is not by any means a Scotch paradise. Most of the bars had a blend or two to offer and usually had one or two single malts for the special desires of a customer. Glenfiddich 12 year and Glenlivet 18 year where the most one could expect. However, upon sitting down in “The Peak Bar” over looking the city, I was pleasantly surprised to find a selection of single malts with some older age statements. It is not often that I enjoy spending the high prices that older drams command at drinking establishments. I usually prefer to purchase an entire bottle of good whisky for the same amount that a dram of older whisky costs at a bar or restaurant. In this case, the prices were so reasonable (40% of American norms) that I decided to enjoy a few. As a Malt Minion, my most recent task has been to sample several whiskies head-to-head for comparison and to contrast the flavors and distinctive tastes. My home bar was a fine source for the average dram and the everyday names that you can find on the Bang-for-your-Buck List. At “The Peak Bar” I had the luxury of ordering a head-to-head sampling while perched atop Hong Kong city on an amazingly clear night with the Glenmorangie 18 and a Macallan 18 and no distractions. I found that my head-to-head samplings at home between the Glenfiddich 12 vs. Glenmorangie 12 year Port Finish; Speyburn 10 year vs. Glenlivet 18 year; and the Aberlour A’bunadh Batch 18 vs. Balvenie 15 year Single Cask produced striking results that a relative newbie like myself could not adequately describe. The taste differences were dramatic and the idea of the assignment was to relate the experiences. Each of the three H2H samplings produced the same general notes and descriptions; The lesser wood finished drams (Glenfiddich, Balvenie, Speyburn) produced what I refer to as a sharper, crisper mouth feel with more of an alcohol nose. The wood finished or aged drams were darker, deeper, sweeter flavors with a longer warmer sensation. The A’bunadh produced a taste that for the first time, I was able to relate to a “meatier” flavor that I have read so much about from the maniacs. The Glenmorangie had a distinct wood taste that although I have tasted it before, was definitely more pronounced when sampled immediately after the Glenfiddich. Having recognized the value in these H2H assignments, I have taken it upon myself to enjoy my drams in twos as opposed to single pours. I find that only an H2H can give me the relative distinctive tastes to allow for any description. As my training progresses and my samplings widen, I am sure I will come to determine words that will describe just what my mind tells me I am experiencing. I imagine I will find it difficult to replicate the sense of joy I experienced while conducting the H2H at The Peak Bar. It was a moment I will recall for the rest of my life. The beauty of the lit city and the water reflecting the lights from the skyline buildings together with the relative calm of the corner table against the glass where I sat was all I could ask for. The experience was simply amazing. As to the drams, I found the Glenmorangie 18 to be quite citrus with a distinct orange/tangerine taste (I still wonder how that gets in there). The Macallan 18 was a much deeper and darker sweetness version of the 12 year expression I have at home. Macallan has always been a favorite of mine and I tend to prefer the wood finishes to straight oak. I have never been a big fan of peated malts as the medicinal flavors are a turn off (reminds me of childhood injuries). The two 18s together were clearly superior to their younger counterparts. By superior I mean smoother with less sharpness and bite. It has been my experience that when I sample a malt and I forget, even for the slightest moment, that alcohol is present, I have sampled what to me is a fine dram. While Hong Kong would still not make my list of desired places to visit if given a weeks time and an open ticket, I am grateful that I have had the chance to experience such a vibrant and interesting city. If you have the chance, take advantage as you will not be disappointed (leave the younger ones at home). As a Minion, I clearly have much to learn as I eagerly await each and every Liquid Log and Malt Madness Entry. The Malt Minions Whisky school has taken a bit of a break to allow the holidays to pass smoothly and to allow the Maniacs to conclude their awards drams without undue interruption. I can say that I await my next lesson with enthusiasm as I have learned not only what to drink, but how to drink it in my short time as a Malt Minion. It is my sincere desire to stand with the Maniacs one day and be able to keep score with those that have such enormous experience. Until that day arrives, I shall follow orders and do my homework as a good minion should. After all, where else can I find that my professor requires me to have a dram or two (or sometimes more!) as my assignment.